Experience the physical benefits and body awareness from hatha yoga—the most popular form of yoga today. 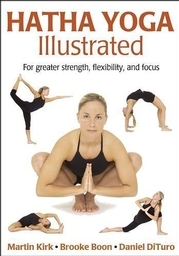 Hatha Yoga Illustrated presents nearly 650 full-color photos to visually demonstrate 77 standard poses from hatha yoga that apply to all major hatha styles including Iyengar, Astanga, Anusara, and Bikram. Martin Kirk, MSBME, E-RYT 500, is a certified yoga instructor who offers workshops and teacher trainings globally and online. With a Masters Degree in Biomedical Engineering, he has a special gift for anatomy and therapeutics. His passion for educating others about the body has created worldwide demand for his trainings. Martin's accomplishments include successful careers as an engineer in the space and biomedical industries. He lives in Scottsdale, Arizona, with his wife, Jordan and their son, Jonathan. Brooke Boon is cofounder of Studio Om Yoga and Tai Chi in Phoenix, Arizona. She received her certification through Baptiste Power Yoga Institute and is a registered yoga teacher as well as a member of the Arizona Yoga Association. Her certification came after working with world-renowned master teacher Baron Baptiste. Boon's teaching style is designed to promote stability, strength, and serenity as well as create hormonal and emotional balance. She specializes in power vinyasa and also instructs classes for mature adults, athletes, and expectant mothers, emphasizing that yoga is for everybody. Daniel DiTuro was born in Phoenix, Arizona, and is a graduate of Arizona State University with a bachelor of science degree in mechanical engineering. He has worked as a mechanical engineer since 1980. His interest in photography began at the age of 10. In 1986 he started DiTuro Photography, specializing in commercial and portrait photography. "Hatha Yoga Illustrated is a complete and practical introduction to the physical practice of yoga that serves as a fantastic starting point on the road to both physical and emotional wellness."